Not only can you use your Droid X to call folks who live in other countries, you can also take your Droid overseas and use it in another country. International calling of any sort on the Droid is easy to do, but you have to know the proper procedures. To make an international call with the Droid X, you merely need to know the foreign phone number. That number includes the international country-code prefix, followed by the number. Before dialing the international country-code prefix, you must dial a plus sign (+) on the Droid X. The + is a universal country exit code on the Droid, which you must dial in order to exit the national phone system and access the international phone system. For example, to dial Finland on your Droid X, you dial +358 and then the number in Finland. The +358 is the exit code plus the international code for Finland, 358. 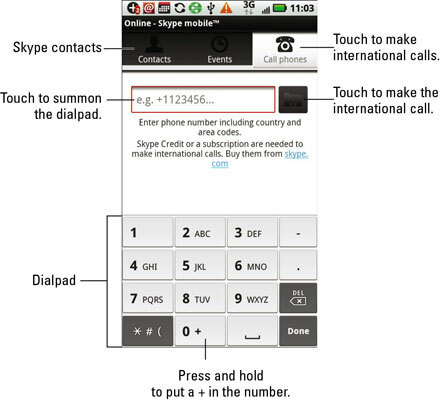 To produce the + (plus sign) in an international phone number, press and hold the 0 key on the Droid X dialpad. Input the country prefix and the phone number. Touch the Dial button (the green phone icon) to complete the call. You can also send text messages to international cell phones. It works the same as making a traditional phone call: Input the international number into the Messaging app. Your Droid X comes with the Skype Mobile app, which you can use to make inexpensive international calls. It’s an excellent option, especially when your cellular contract doesn’t provide for international calling. If you don’t yet have a Skype account, use your computer to create one at the Skype Web site. You need that account to use Skype Mobile. Further, you must have Skype Credit to make the international call. You can purchase that credit from within the Skype program on your computer. Open the Skype Mobile app in your Droid’s Applications Tray. Log in with your Skype ID and password. You can’t make an international call unless you’ve created a contact with an international number. The contact must be a Skype Mobile contact, shown on the Contacts tab on the Skype Mobile screen. To make an international call, touch the Call Phones tab at the top of the screen. Punch in the number in the text box, including the + sign for international access. Touch the Contact button to make the call. After the call is connected with Skype Mobile, the Droid X touchscreen looks similar to the way it looks when you regularly place calls. If necessary, use the phone dialpad, mute the call, put it on speaker, and so on. When you’re finished with the call, touch the End button. You’re always signed into Skype Mobile unless you sign out. Pressing the Home button to switch away from the app doesn’t log you out of Skype. To log out of Skype Mobile, press the Menu soft button and choose More→Sign Out. When you opt to use your Droid X rather than buy a local phone, things should run smoothly — if a compatible cellular service is in your location. (The Droid X uses the CDMA cellular network.) The foreign carrier accepts incoming and outgoing calls from your phone and cheerfully charges you the international roaming rate. The key to determining whether your Droid X is usable in a foreign country is to turn it on. 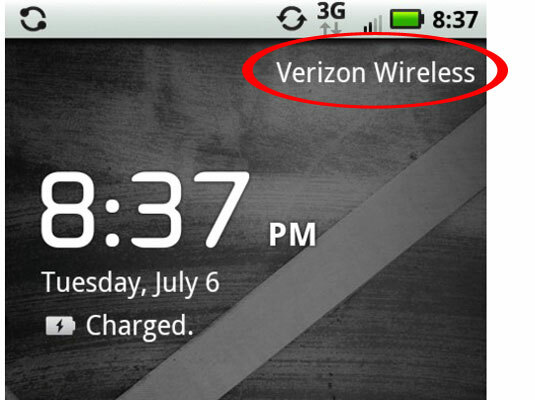 The name of that country’s compatible cellular service should show up at the top of the phone, where Verizon Wireless (or whatever your carrier is) appears on the Droid X Home screen. You receive calls on your cellphone internationally as long as the Droid X can access the network. Your friends need only dial your cellphone number as they normally do; the phone system automatically forwards your calls to wherever you are in the world.